Are you trying to figure out what type of natural fiber rug to buy like sisal, jute, and sea grass? You may want to consider an indoor/outdoor synthetic option instead. 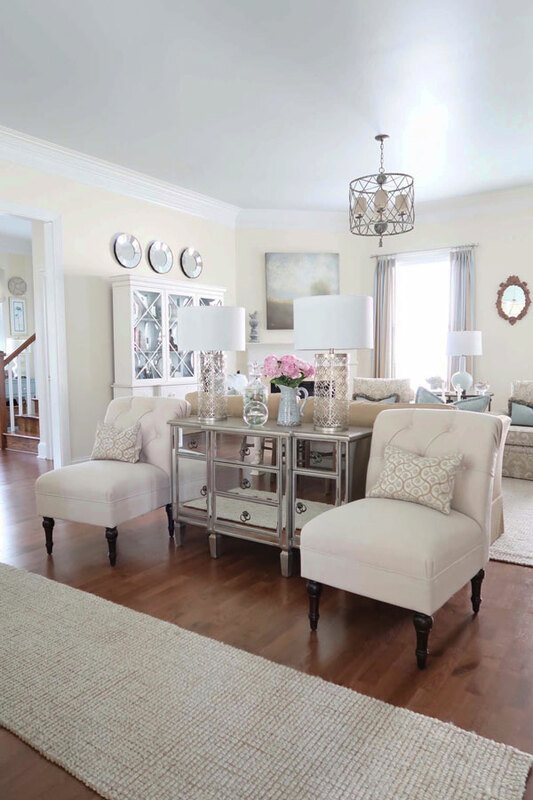 There are SO many natural fiber rug choices these days and trying to figure out which option may be right or totally wrong for you can be really confusing. 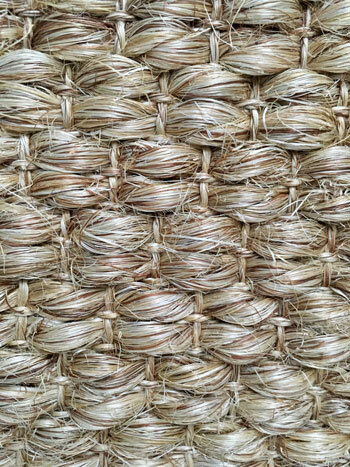 If you are considering buying a sisal, jute or sea grass rug, please read this first. You may just change your mind! Let’s chat about this shall we? There is SO much to consider when looking at a truly natural fiber rug, which is a rug made of GRASS. I’ve had both sisal and sea grass rugs in my home IN MY DINING ROOM. Let that sink in for a minute. 100% natural fiber rugs have their challenges. One of which is cleaning! When I’ve decided to go truly natural fiber, it’s been in my least used room. I could keep my kid out of there until allowed and at the time didn’t have any pets. The rug stayed protected and wasn’t used more than a few days a year. 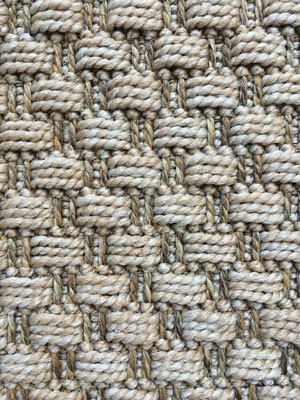 Here is a close up of my current Sisal rug. Stuff gets trapped into those nooks and crannies, but it has a beautiful sheen, a thick chunky weave, and a beautiful look in the room! However, natural fiber rugs have their drawbacks. So why am I bringing up all of these concerns. Because I have dealt with them over the years! The first sisal rug I purchased was when my son was about 8 and he was neat. 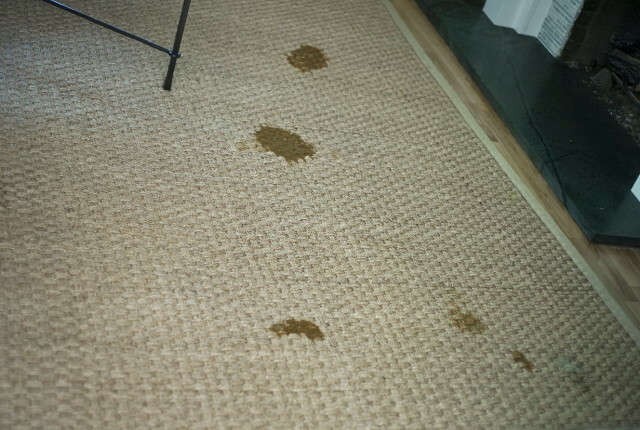 It was the adults that were the issue – then I got a dog who wouldn’t go potty if it was raining, before I left for a long day at work. If it’s not a blend and just natural fibers, none of it really comes out. You can’t get the rug very wet or scrub too much because it will leave a water mark or a cleaner stain. After all of that, why would I want to buy one Tracey? Comes from the leaves of a cactus plant! Very durable and is what rope is usually made of. It typically comes in a smaller texture weave and is softer on bare feet. Comes from a thicker grass and typically crafted in a wider weave with a natural sheen. It has a slight green cast and is the most stain resistant of the three due to the fact it’s naturally more smooth. I walk over my sea grass rug with bare feet and find it comfortable. Naturally is more rough and is typically blended with another fiber to make it softer and smooth out the natural barbs. If I haven’t scared you away from buying a natural fiber rug or you already own one, let’s talk about what you need to do to keep it looking as good as you can for as long as possible. Accidents happen! 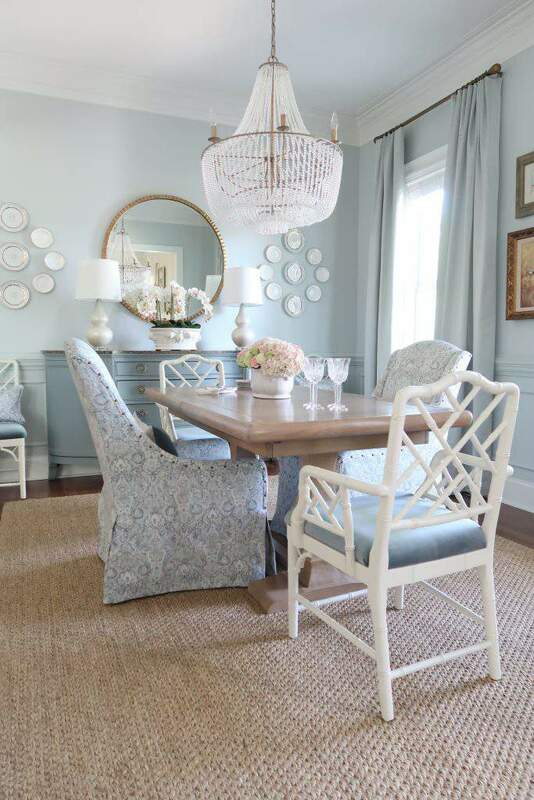 Above is my recently re-decorated dining room (read about it HERE) with a brand new sisal rug. Of course I have protected it and want to help show you how! All of the products I am recommending, have been used on my rugs. Aerosols are not for everyone and I’ve used the pump spray version as well, but it doesn’t go as quickly. I’m recommending HEAVY duty outdoor protectants. Don’t go for the wimpy stuff! You’ll need at least 2 cans/bottles. Open windows slightly before applying to let the fumes out. Remove all chairs or items off of the rug that you can. Protect the areas that you don’t want sprayed. I lay down towels under the rug to protect the hardwood. Spray on about 8 to 10 inches from the surface of the rug. Allow to dry overnight – I’ll usually do this before I go to bed, when the house is quiet and people/pets are asleep! REAPPLY right before you are hosting a big gathering. Yes, the night before I have a party I’ll spray down my rugs and upholstery with the same stuff! At this point, if you want a natural fiber rug it’s really simple – buy based on the look of the rug. Really! READ the reviews before you buy online or visit a store to see it in person. The actual fiber really isn’t going to make too much of a difference because the pros and cons are pretty much the same. Manufacturers are now dying and printing the natural fiber rugs – especially jute, so you can find some that are in a color or multi-colored! The rug manufacturers have worked hard to make natural fiber rugs much softer and are blending them with cotton, denim, wool, and chenille. If you want a SOFTER and more CLEANABLE rug, look for a BLEND and I’ll include some below. Scared of a Buying a Natural Fiber Rug, but love the look? Ok, I can see how I may have scared you or you realize that in all practical terms it may not be the right option in your household. Guess what? 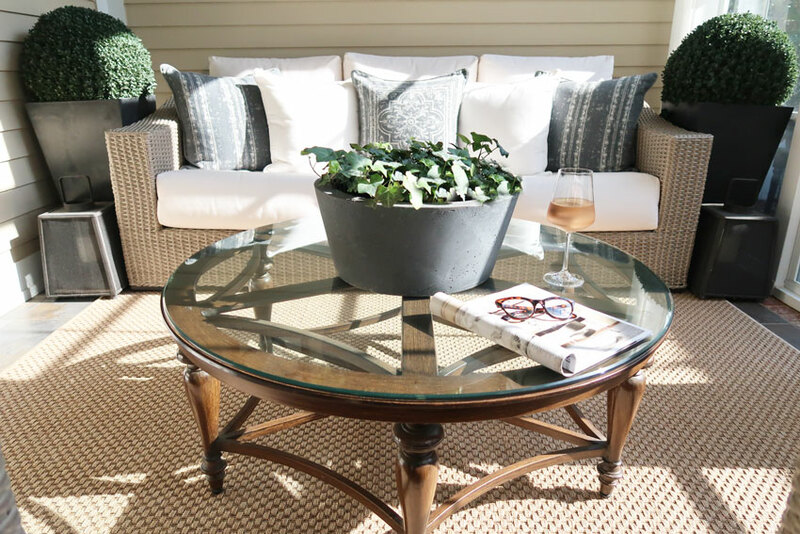 If you love the look of a natural fiber rug there are now options that are synthetic and INDOOR/OUTDOOR. 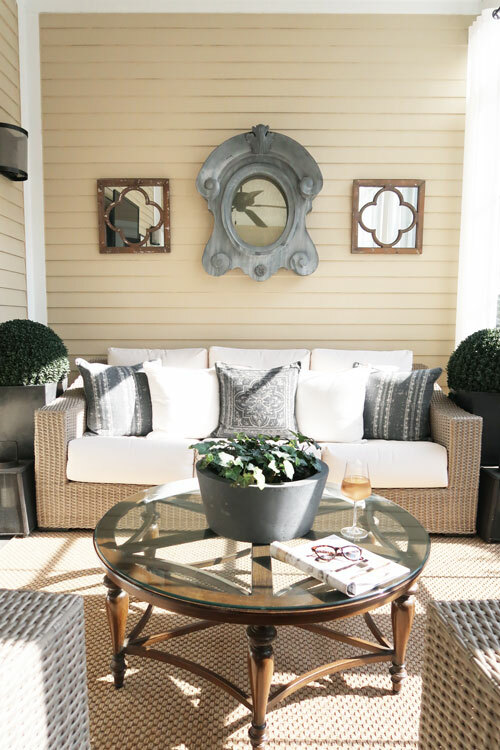 I just recently purchased a natural fiber looking indoor/outdoor rug for my enclosed back porch and love the look! See for yourself…here is a close up. You can see it is a smoother texture weave, without barbs sticking up. Spill red wine or coffee – no problem! It comes right up. To me the pros outweigh the cons. If you are worried about it being synthetic, air out the rug in the garage or even outside for a bit before bringing it inside. I have 4 indoor/outdoor rugs in my home and I LOVE them! One is on my front porch and I hose it off every week (read about my coastal front porch makeover). That’s how durable these rugs are! I kept the selections in similar fashion with the natural fiber rugs, but it is amazing ALL of the color, texture and pattern options available. For more options, CLICK HERE! Do you want to know what rug is my absolute favorite in my home? The wool and jute rug! It is so soft on bare feet. I have an 8 x 10 in my family room and a 3 x 9 runner in front of my sitting area. They have both weathered what life has thrown at it for 8 years and the runner is in my main traffic path straight through my home! We can lay on it and play with the dog because it is that soft. It’s the best of all worlds! As they say, forewarned is forearmed! You now have the ability to make the best decision for your lifestyle, home, and family PLUS get the look you love! For more tips and tricks please consider signing up for my weekly newsletter! « Fake a Tan: Oil Drops for Your Lotion!